It’s a PITI that people don’t know better. Your payments on a home include Principal, Interest, Taxes and Insurance. Yet often one or more of these — usually taxes, insurance or both — is conveniently omitted in pitching how attractive home ownership supposedly is. For example, the Miami Herald runs an article every now and then titled “What Can You Get for $. . . .”, with a different arbitrary price point each time. 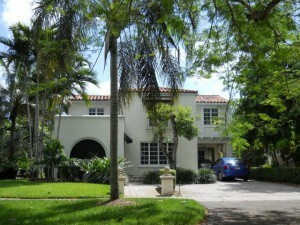 The article presents about five properties for sale at about that price point in Miami, Miami Beach, Coral Gables and surrounding real estate markets. An introductory paragraph says how much your mortgage payment will be, but notes that taxes and insurance are not included. Estimated taxes are listed separately in the information for each property. The cost of insurance is stated nowhere. If you’re not careful, you might think that the cost of ownership is basically the cost of the Principal and Interest portion that’s stated very precisely. In the latest installment, the Herald asks What Can You Get for $647,000. Readers are told that “[m]onthly mortgage payments (not including taxes or insurance) would be $2,561.” Such precision. So little meaning. For the first property listed in the $647,000 article, taxes are estimated to be $14,163. It’s not a big house, but insurance will surely cost thousands more. (Would it really be so hard for a reporter to get an insurance quotation for each property before running a story?) The monthly payment is probably more like $4,500, not $2,500. Think that makes a difference to your budget? Oh, and don’t forget maintenance. As a rule of thumb, you would do well to regard the true cost of ownership as about 10% of the purchase price — o.k., maybe 9% in these days of extraordinarily low interest rates. Why so much? Currently, you can figure that the Principal and Interest payment is about 5%, Taxes are about 2%, and Insurance is usually about 1% to 1.5% (depending on the storm-resistance characteristics of the house). Maintenance will add about 1% on average over time, once you take into account the intermittent big jobs (roof, paint, pavement, etc.). Yes, you get a tax deduction for the interest and property taxes, but that’s only a benefit to the extent it exceeds the standard deduction you can get anyway. In the example from the Herald, the reporter assumes a hefty 20% downpayment, compressing the Principal and Interest payment to about 4.7% of the purchase price. The estimated taxes amount to another 2.2%. So you’re at 6.9% before insurance and maintenance. You might come in a little under 9% of the purchase price, but only if you put that 20% down. Don’t be fooled. Do the math. 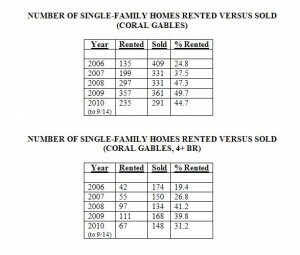 Looking to buy a house in Miami or Coral Gables? Great! How much will you need as a downpayment? Why, 100%, of course! 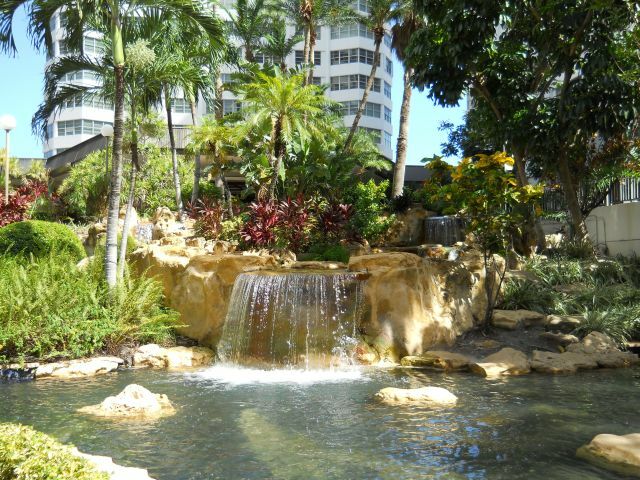 Cash deals are not normal in real estate — not in Miami or Coral Gables, or anywhere else for that matter. But these are not normal times. 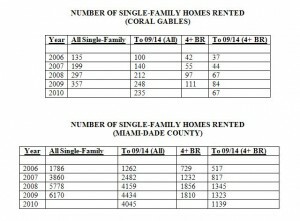 All-cash deals have become a stupefying 60% of all single-family home sales in the Miami and Coral Gables area. For luxury homes selling for more than $2.5 million in Miami and Coral Gables, the share of cash deals has reached 72.8%. But you expect a high proportion of cash deals (o.k., not that high) from people who are truly wealthy. The really amazing numbers are in the price ranges where you know people ordinarily borrow to buy. For 63% of deals below $425k to be cash, or 53.9% of deals between $700k and $1 million to be cash, is flabbergasting. Who knew everybody had so much cash lying around? 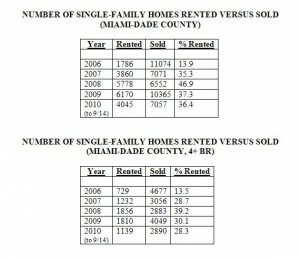 Are investors replacing failed would-be homeowners and suddenly deciding to become landlords in Miami and Coral Gables? Or did this many people see it all coming, sell their houses near the peak and rent for a couple of years, so they can come back in now with cash? A recent post showed how rentals rose dramatically and appear to have peaked. But it’s hard to believe that so many people timed it all so well. We’re talking 60% of sales. 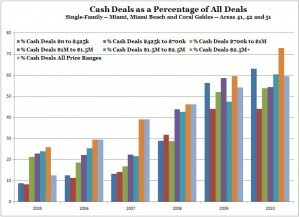 Certainly cash deals cannot continue to make up 60% of all transactions in the Miami and Coral Gables real estate market. And indeed, the degree to which the percentage this year exceeds the percentage in 2009 is less than the degree to which the percentage in 2009 exceeded the percentage in 2008. The second derivative is slowing. As the cash buyers fade, what happens next? 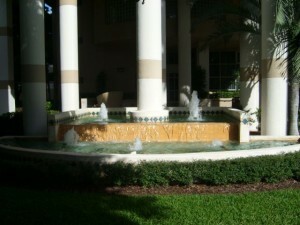 Fountain at Four Ambassadors condo, Brickell Bay Drive, in the Brickell neighborhood of downtown Miami. Closed sales data are key to understanding current conditions in the real estate market. Although broad indices like the FHFA House Price Index or the S&P Case-Shiller Home Price Index break down the numbers by metro areas, including Miami, real estate values can be highly localized. 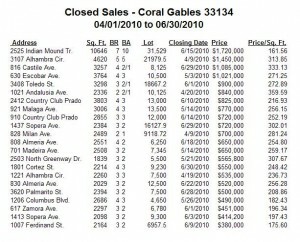 The table below reports closed sales of single-family houses in zip code 33134, which is mainly within Coral Gables. 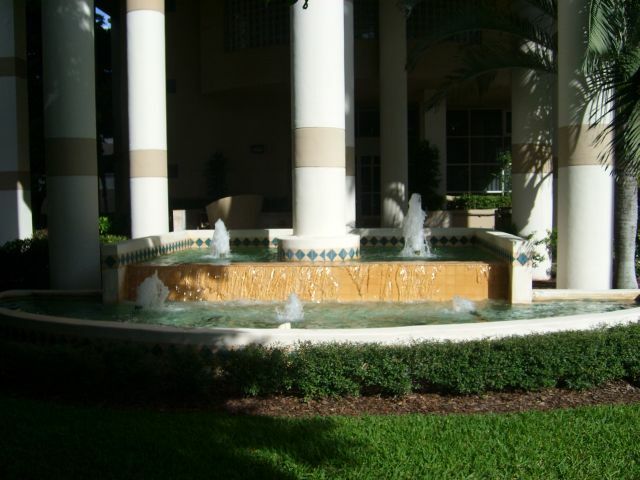 Because The Real Estate Fountain focuses on mid-range to luxury properties, the table generally excludes sales of small homes on small lots, like the many bungalows found in north Coral Gables. Data are from tax records, and thus include transactions both on and off the MLS. 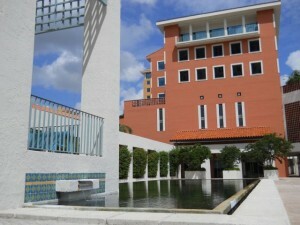 Wall fountain and reflecting pool at Columbus Center, 1 Alhambra Plaza, Coral Gables. The entire 60,000-sf west wing of Columbus Center is available for lease, with the ideal candidate being a single tenant who will make it a headquarters location. Space is also available in the taller 200,000-sf east tower. At the top of the market, you were a putz if you didn’t own a home — and preferably more than one. Renters were losers. Well, the worm certainly turned, eh? In Miami and Coral Gables, renting a home shot up in popularity as it dawned on people that it’s better to pay half the cost of ownership and skip the massive capital losses. Why buy a depreciating asset with borrowed money, especially when you can rent it for half the cost? Certainly the advice you got here was to rent, not buy. Alas, home ownership is a relentless lure, and the stabilization in home prices in Miami and Coral Gables appears to have turned the tide from real estate rentals back toward real estate sales. This is true across the board for single-family homes: in Coral Gables as well as Miami-Dade County, and for larger homes (4 bedrooms or more) as well as the entire market. 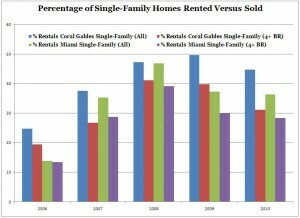 The number of rentals appears to have peaked in 2009, as the pace in 2010 is running behind the pace of last year’s high. 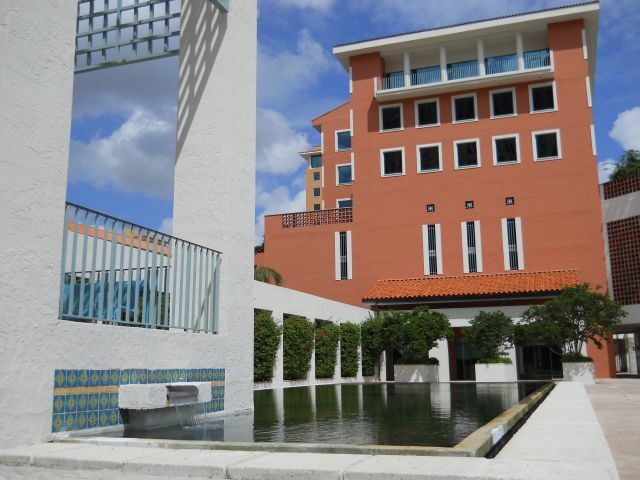 In Coral Gables, rentals went from barely more than 10% of real estate transactions to nearly 50% of real estate transactions. Considering that real estate agents make about 90% less on rentals than sales, you can assume a lot of people found themselves with essentially no income. Data are from MLS and therefore do not account for sales outside MLS. Photo of fountain in the courtyard of Fontana, one of several restaurants at the Biltmore Hotel in Coral Gables. There’s a reason it’s called Fontana. No money down loans from the government for homebuyers. Makes for a sensational story, but keep in mind that standard FHA loans require only a 3.5% downpayment. At present, the no money down program is available in only four states, not including Florida. So anyone looking to buy real estate in Miami or Coral Gables will have to come up with the usual 3.5% if they want an FHA loan. A previous post discussed the firm demand for real estate in the Golden Triangle neighborhood near the Biltmore Hotel in Coral Gables, and cited as an example the possible sale of the house at 3717 Toledo Street in Coral Gables. The sellers wanted no less than $850,000, and it seemed like they might have gotten it. Indeed, they did. Sold for $850,000. That’s not cheap, when you consider that even the sales pitch conceded that this well-worn Coral Gables home needed at least $250,000 of work. 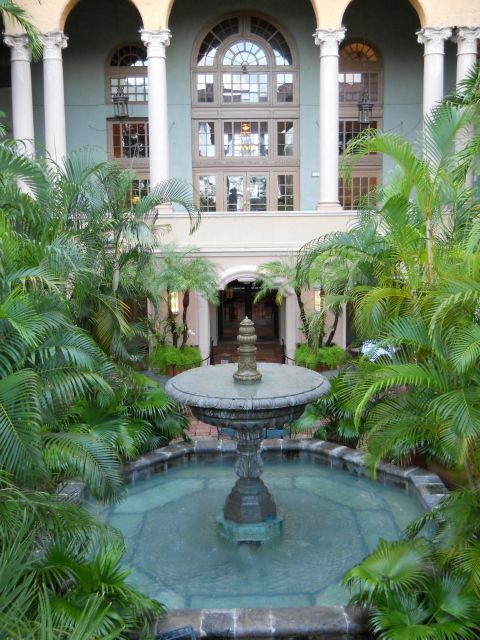 But at $248/sf before renovation or $320/sf after renovation, the price is in line with the market for sub-luxury professional homes in Coral Gables. Upper-middle-bracket buyers continue to face meaningful competition from one another in the quest for a decent home in the Miami area. The desire for a signature older home instead of a cookie-cutter South Florida ranch is a principal attraction of Coral Gables. 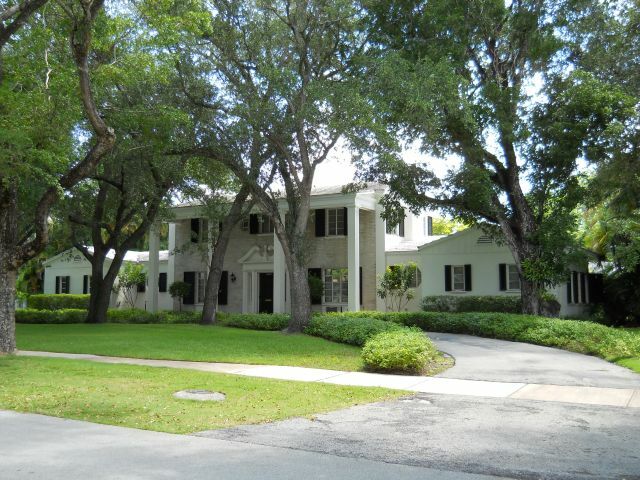 Make no mistake — the bulk of the housing stock in Coral Gables consists of undistinguished cookie-cutter ranches. But at least Coral Gables has a decent selection of older homes as well. If you’re trying to rise above the vast architectural wasteland that is South Florida, you don’t have many alternatives. Photo of fountain at Isola, a 31-story, 130-unit condominium at 770 Claughton Island Drive, on Brickell Key in downtown Miami. Isola was built in 1990.